A terrific Quarter-finals night of the 2017 Qatar Classic, the second PSA World Series event of the season, started with an amazing all-Egyptian marathon at the Khalifa International Tennis and Squash Complex in Doha, and ended with two upset results as the semi-final ineups were decided. Two-time champion Mohamed Elshorbagy met compatriot Ali Farag for the third time in three weeks, and after sharing the U.S. Open and Channel VAS titles, they treated the enthusiastic crowd to a tremendous five-game thriller with Elshorbagy emerging the victor after an hour and a half of top quality squash and entertainment. 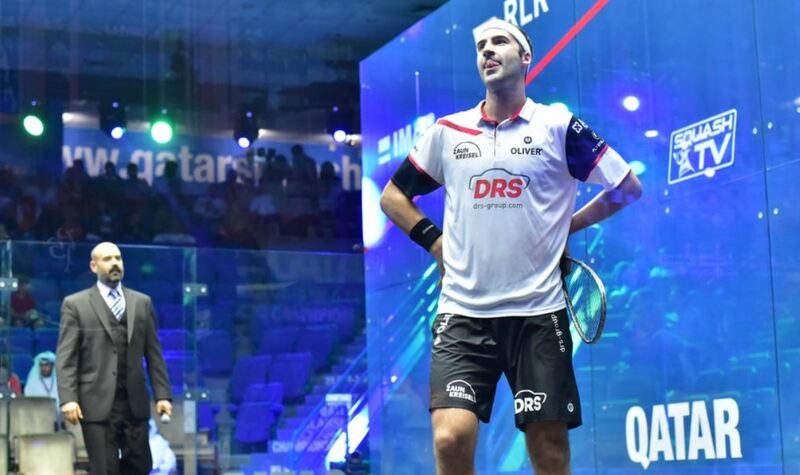 Top seed and World #1 Gregory Gaultier continued his impressive form in his first tournament of the season after injury kept him out of the opening weeks, despatching surprise quarter-finalist Diego Elias in straight games to set up a semi-final with Elshorbagy. The second semi-final will be between two players making their first appearance in the last four in Doha. Germany’s Simon Rosner followed up last night’s win over defending champion Karim Abdel Gawad with another Egyptian scalp as he beat Marwan Elshorbagy in four games. Rosner will face another Egyptian tomorrow after Tarek Momen upset fourth-seeded Nick Matthew in four games, repeating his win over the Englishman in their first meeting in the 2011 Classic, since when he had lost seven times to Matthew.